Auf dem früheren VOX Treble Booster der 60er jahre basierend bringt der RMG nur wenig Gain mit und ist aufgrund seiner speziellen Klangabstufung in der Lage, einem Clean-Sound das richtige Maß an Ecken und Kanten und ordentlich Twang hinzuzufügen. Sein Klang ist eine Hommage an den glasigen Jingle Jangle Sound eines Roger McGuinn von den Byrds, sozusagen der einer gepushten Akustikgitarre, den man erzielt bei voll aufgedrehtem Tone Poti. Dieses Poti ermöglicht vielseitige Nuancen: wenn es in der Mitte steht, erhält man einen punchy Sound mit milden Höhen und mächtigen Bässen, wie er in Country und Rockabilly beliebt ist. In Minimalstellung des Poti wird es bluesig, mit genug Mitten und schimmernden Höhen für Jazz und Swing, Bebop und ähnliches. Nahezu jeder Gitarrensound profitiert enorm vom RMG, klingt direkter, gerade wenn ein superber Clean Sound essentiell wichtig ist. Auch geeignet, um eine Stratocaster wie eine Telecaster klingen zu lassen, oder sogar für Akustikgitarre. Um die Möglichkeiten des RMGs voll zu erschließen, benutzt man ihn am besten mit einem Kompressor, entweder davor oder dahinter. Analoge Modelle klingen besser, aber auch digitale sind möglich. Als einer der ganz wenigen Booster macht er vor Transistorverstärkern ebenfalls eine ganz hervorragende Figur und er wird vor allem von Gitarristen gern eingesetzt, die ausschließlich clean spielen. The BSM RMG model is based on the british Vox Treble & Bass booster made in the late 60's, used by many british bands at this time. Here is a custom version of this Vox unit as a homage to the famous BYRDS guitarist Roger McGuinn and his signature "jingle jangle" sound. 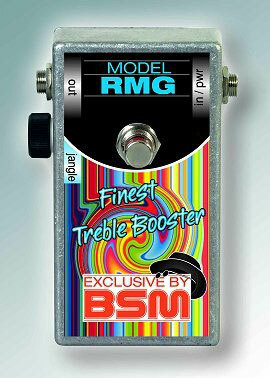 The RMG´s customized tone network, makes it the perfect treble booster for all clean sounds. 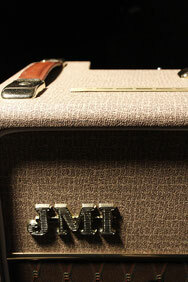 The RMG model includes a tone control, that allows an extraordinary amount of versatility. It can add a lot of twang and spank to any guitar sound. By pronouncing the percussive attack in a very musical way, any guitar will sound more "in the face" that way. With the tone pot set to maximum (5:00 o´clock), the unit will produce a very glassy tone - the classic "jingle jangle" sound of Roger McGuinn during his mid 60s time with the BYRDS, think of "Mr. Tambourine Man" and you are on the right track. When a middle setting is dialed in (12:00 o´clock), the result is a punchy tone, with mild highs and a tight and powerful bass bottom, a perfect sound for any Country/Nashville and Rockabilly style. If it´s set to minimum (7:00 o´clock), you will get a bluesy bottom with enough mids and a little bit of shimmering highs for all you jazz and swing cats out there. The RMG fits perfectly all kinds of music, where a good clean tone is essential and you can use it for all styles of Country, Rockabilly, Jazz, Swing, Bebop and many more. The RMG can also make any standard Stratocaster sound like a Telecaster guitar ! To take full advantage of the RMG´s possibilities, you should use it together with a compressor. You can run the RMG into the compressor or vice versa, feel free to experiment and find out what you like best. In general the RMG works better in combination with analog compressors than with digital devices, same with chorus and delay. The RMG sounds great in front of any tube or transistor amp, so it´s one of the very rare boosters, that also work great with transistor amps, often preferred by guitarists playing clean all the time. You can even use your RMG with your acoustic guitar.